Along the Plaisance, Chicago Tribune supplement, July 9, 1893. This lesson explores how the Chicago World’s Fair of 1893 helped transform the lives of people in Chicago and in the rest of the world. Students activate their prior knowledge and build background by examining the meaning of the words “invention” and “innovation.” They share their ideas about what a World’s Fair would be like. Next, they view and analyze the painting Golden Doorway of the Transportation Building: World’s Columbian Exposition, 1893. They deepen their analysis by reading an informational text about the artwork. Then they read a short story about the 1893 World’s Fair and note the types of inventions and innovations that are mentioned in the story. They discuss how these inventions and innovations might have changed people’s lives. Next, students look closely at the lithograph Along the Plaisance and read an informational text about this artwork. They discuss what the artwork and text add to their understanding of the fair, including the cultural benefits. As a concluding activity, they create posters that inform the public about the three greatest accomplishments of the 1893 World’s Fair and explain how they will transform lives. Some background on the 1893 World’s Fair would be helpful but is not required. How can inventions and innovations transform people’s lives? How did the Chicago World’s Fair of 1893 affect the people of Chicago and the world? Throughout our history, new inventions and innovations have brought about changes in the way we live. The 1893 World’s Fair helped transform people’s lives by providing a place where inventions and innovations could be presented to the world. Students will read closely to determine what a text says explicitly and to make logical inferences from it. Student will cite specific textual evidence when speaking to support conclusions drawn from the text. Students will integrate and evaluate content presented in diverse media and formats including visually as well as in words. Students will write informative/explanatory texts to examine and convey information clearly and accurately through the effective selection, organization, and analysis of content. Nesbitt, Kris. “The Best of the Fair.” Chicago History Museum. Accessed September 17, 2014. http://www.chicagohistory.org/greatchicagostories/worldsfair/story.php. Chicago History Museum. “Photo Gallery: The World’s Columbian Exposition.” Accessed September 19, 2014. http://www.chicagohistory.org/history/expo/photos.html. Activate prior knowledge and build background: Write the word “invention” on the board. Invite students to share what they already know about this word. Have students name some inventions that they use at home, such as a toaster, a microwave oven, or a cellphone. Then write the word “innovation” and ask if students know the meaning of this word. Explain that inventions are one type of innovation. Innovations can also include new ideas or new ways of doing things. For example, kindergarten was a new idea in the mid-1800s. Providing education for children younger than six was an innovation that gradually spread to more and more schools. Generate discussion around the prompt “What do you think a World’s Fair would be like?” Have students describe how a World’s Fair might be the same as and different from a neighborhood fair or another familiar festival. Introduce Golden Doorway of the Transportation Building: World’s Columbian Exposition, 1893: Give students copies of the artwork or project the image on a screen. 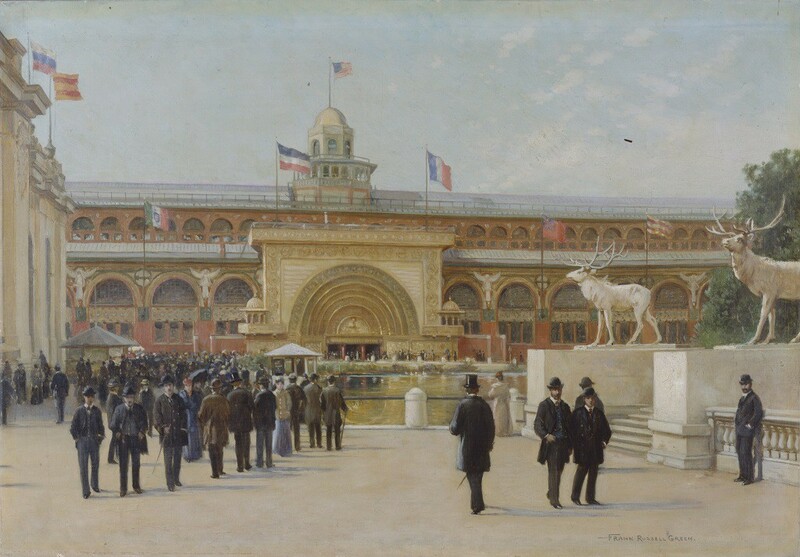 Explain that this painting shows a scene from the Chicago World’s Fair of 1893. Ask them to look at the artwork and share their first impressions about what they notice in this scene. What details do you notice about the buildings in this painting? What is the significance of the different flags? What words would you use to describe this place? What do you think the artist wants to communicate about the 1893 World’s Fair? What details in the painting help express his message? Does the text cause you to rethink your ideas about the artwork? If so, how? 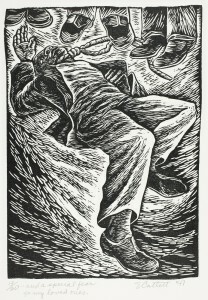 What does the text add to your understanding of the artwork? According to the text, how was the Transportation Building different from other buildings at the 1893 World’s Fair? Which of these differences can you observe in the painting? What does the text add to your understanding of the fair? When students have completed their annotations, invite them to share their questions about words and phrases in the story and the other questions they have. Provide support by clarifying meanings as needed. Then have students share the forms of transportation, new inventions, and surprising sights that they identified in the story. Which innovations surprised or delighted Lily and Joseph the most? Lily and Joseph did not go inside the Transportation Building. Think about the text you read about this building. What would they have found exciting inside the Transportation Building? If you were at the World’s Fair, which innovations would you have most wanted to see? Lily and Joseph saw many inventions and innovations at the fair. Which of those items are just a normal part of our lives today? How did those items transform people’s lives? You read about the Midway in the story “The Best of the Fair.” What does the story add to your understanding of this image? The Midway offered many different ways to have fun. If you were inside this image, what would you do first? Why? Notice what’s in the foreground, the middleground, and the background. 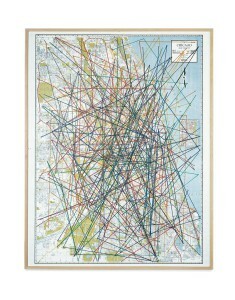 What do you think the artist wanted to communicate about the Midway? What evidence is in the painting to support your ideas? Describe the people. What does their clothing tell us about them? What did you learn about some of the details in the artwork? 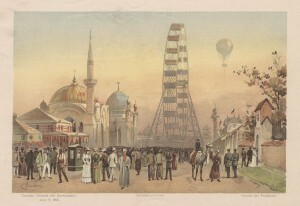 What does the text add to your understanding of the 1893 World’s Fair? Both the image and the text make the point that people from around the world came to the fair. What do you think were some of the benefits of this? What do you think people from the U.S. and from other parts of the world learned from each other? 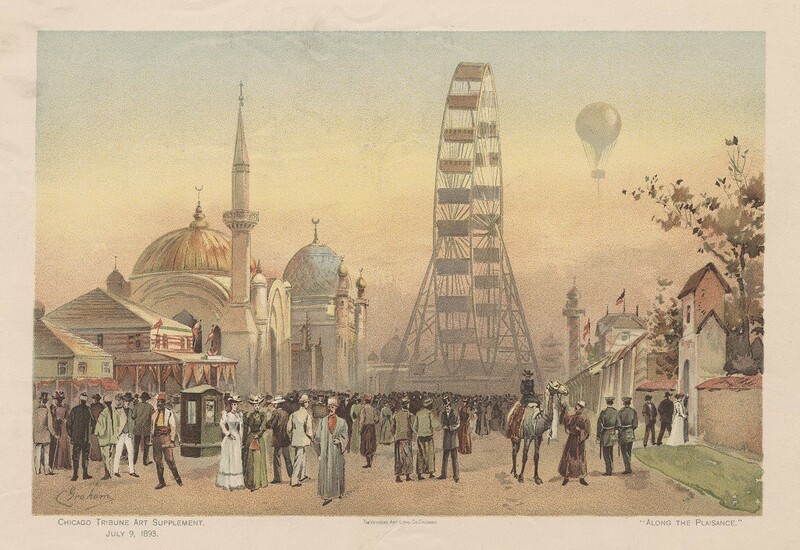 Have students create posters for the 1893 World’s Fair: Have students work alone or with partners to create posters that will inform the public about the three greatest accomplishments of the fair. These could include the most significant innovations, the cultural benefits of the fair, or its impact on the city of Chicago. The posters should include text that describes each accomplishment and explains how it has transformed or will transform people’s lives. 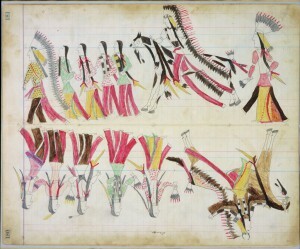 For more images of the fair, students can explore the related photo collections of the Chicago History Museum (http://www.chicagohistory.org/history/expo/photos.html). Who would use this item? What materials or technology would be needed? How will people use this innovation? How would you convince people to buy this innovation? Have students create a drawing or a model of their innovation, as well as a poster or flyer that advertises their item as well. Then have students showcase their innovation plans and their posters at a class innovation fair.